The new face of the 2016 Chevy Silverado is going to look remarkably different. The redesign of the classic truck has removed the dual-stacked headlights that have graced the front of the truck since the 80s. The single headlights lined by accenting LED strips will give it a bit more techy look to replace the iconic lights. This is just one example of the many changes available in the newest version of the Silverado, as Chevy strives to remain current alongside the many changes Ford brought to its F-150 and Chrysler brought to the Ram in 2015. This is not the first change to the Silverado in recent years, but it is perhaps the most radical change to the truck’s exterior. In 2014 the manufacturer redesigned the truck, but most felt that the changes to the exterior were not too distinctive. In fact, few could see differences between the exterior of the two trucks. This is not the case for the 2016 redesign, which has a radical new look. The most distinct look will be with the upper trim levels of the newly introduced truck. The Z71, for instance, has two rows of LED lights and an accent bar running the width of the grille that separates the lights. This is a radical, modern look that is sure to please enthusiasts. Chevy also redesigned the lower fascia. Smaller, vertical fog lights have replaced the fog lights on the earlier model for a more streamlined look. The sculpted hood and bold horizontal elements ensures that the truck has a muscular look that is a clear reflection on the power under the hood. The redesigned front-end will ensure that the new Silverado will turn heads. Interestingly, Chevy’s redesign seems to be focused almost entirely on the face of the truck. Mechanical changes are few and far between. It seems Chevy believes that its current engines and options are adequate for the current demand. The trim changes are also minimal. Inside the truck, buyers will see something similar to the current model of the Silverado. There are some interior changes, however. Chevy has assed more active-safety hardware to improve the overall safety of the vehicle. It also added the latest generation of its MyLink infotainment system. The top of the lineup will feature more luxury interior features and an improved trim, as it did in 2014. In addition to changing the face of the Silverado, Chevrolet has added more availability for its eight-speed automatic transition. Where in earlier models of the truck, the eight-speed transmission was only available in a 6.2-liter V-8 model, the 2016 truck will offer the upgraded transmission with the 5.3-liter, V-8 as well. Other engine options have its capable six-speed automatic transmission. Any other details about changes under the hood are being kept under wraps until the truck makes its official debut. Some have argued that the changes are coming too soon after the 2014 complete redesign of the Silverado. Some have speculated that it was the lack of success compared to other redesigns that sparked the redesign. Yet with the announcement, GM noted a 32 percent increase in pickup sales for the year, with 14.6 percent increase in Silverado sales alone, so this is likely not the case. Instead, it seems that Chevrolet thought it was simply time to give the face of the truck an overhaul. 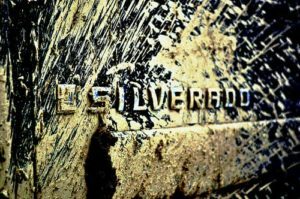 Those who are interested in the rest of the details about the Silverado will need to wait until it is officially launched. Until then, the few pictures that have been launched will have to suffice, giving a little look into the new face of the Silverado.